This project was inspired by the work of the wonderfully talented Dr. Ron Lehocky. This past week Ron showcased some of his new hearts. And to say that there were inspiring is an understatement. I’ve always enjoyed Ron’s hearts, but the simplicity and theme of this batch really got to me. Great work Ron! Gather & condition some scrap clay and set aside for later. Prepare a stack of clay in multiple colors to use as a veneer. Roll 3-4 different colors of clay on different thicknesses of your pasta machine. Stack sheets and trim into a square. Cut stack in half and place on top of first half. Repeat until you have 4-6 layers of lines. 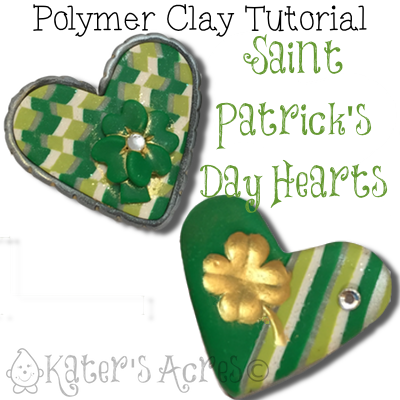 Using your heart cutter, cut a heart shape from scrap clay. Cut a slice from your striped stack. Cut as evenly as possible. Lay this slice over all or a portion of your heart. Completely cover the scrap clay with the clay of your choice. On the final cut, place saran wrap over the clay for a “soft edge” finish. Add any details you’d like: shamrocks, crystals, or even a border. Bake in your oven, covered, for 30 minutes at 275 degrees (if using Premo!). Once your heart is called you can work on the back. Cover the back of your heart with clay. Cover the pin back flat surface with clay. Bake in your oven, face down & covered, for another 30 minutes at 275 degrees (if using Premo! ).